The Island Medical Program is a collaboration between the University of Victoria, the University of British Columbia, and Island Health. It aims to increase the number of physicians practicing on Vancouver Island – and studies show that doctors are more likely to practice in the regions where they were educated. The power of individual philanthropy is transformative. Your support will help the IMP thrive, and will spur the program’s growth as a place for educating the next generation of physicians, many of whom may serve our Island communities. Several individuals, families, foundations, and associations have already made generous donations to the IMP to establish bursaries and scholarships. To date, over $1.3 million has been donated. Most of these funds help Vancouver Island students, including those from remote areas, to pursue medical careers. What are ways I can donate? Your financial donation to the IMP helps to provide the best possible teaching, learning, and research opportunities. Gifts of all sizes are deeply appreciated, and can be directed towards your specific interests. Support laboratories and research groups. Gifts may be made to honor the memory of a loved one or to create a legacy in your name. Your support can be designated to students, research, facilities, or to the area of greatest need, as identified by the Regional Associate Dean. Who can I contact about donations? If you have questions about the ways you can give, or if you would like assistance planning your contribution, please contact the IMP’s Development Officer. The Island Medical Program is truly grateful to the individuals who have chosen to support us. Our program has received some incredible gifts that have greatly enhanced the support for students. We thank our donors for their generosity. Student awards assist in removing some of the financial barriers faced by our students, helping them reach their full potential while being recognized for academic excellence, achievement, and leadership. A number of donors support our students and program. Here are some of their stories – we’d love to add yours. Dr. Basil Boulton received his medical degree from the University of British Columbia and, in 1969, established a pediatric consulting practice in Victoria. He retired from active practice in 2004. He continued his work to improve the healthcare of children until his untimely death in 2008. 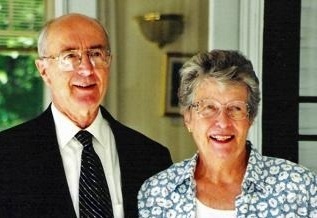 His wife, Marilyn, was instrumental in establishing the Basil Boulton Memorial Scholarship, which is awarded annually to a third- or fourth-year IMP student interested in pediatrics or international health. In 1977, supported by medical colleagues and the public, Dr. Boulton led a campaign to improve pediatric and maternity services, which were split between two major hospitals in Victoria. The result was a well-equipped and well-staffed, integrated unit at the Victoria General Hospital. This endeavor was broadened to include all community child health services with the release of the influential 1980 report on child health care in the Capital Region, which he co-authored with the former deputy health minister James Mainguy. Basil served on the board of the Greater Victoria Hospital Society and the BC Medical Association, and on various Victoria and provincial committees and organizations. He sat on the BC Medical Association Council of Health Promotion and the Child and Youth Health Committee. He was also elected councilor for the Township of Esquimalt. In addition to his service at home, Basil volunteered internationally. As a member of the Christian Medical and Dental Society, he worked with Cuban Ministry of Health and Cuban doctors to improve the health and welfare of children in the country. At the time of his death, Dr. Boulton was developing a bill of rights for children's health and a pilot program in schools, combining a mental health team, medical team, and educators to better support children. Dr. Albert Hung believes in the importance of education and has established a fund to support medical students at UVic. Dr. Hung was born in Fujian Province, China, and moved to Hong Kong during his teenage years. After graduating from middle school, Dr. Hung worked in the Philippines with his father, who was in the construction business. Upon returning to Hong Kong, Dr. Hung embarked on a number of business enterprises. He established companies specializing in a variety of areas, including refurbishing offices and apartments, renovating hotels and offices, importing building materials, producing parts for wristwatches, and currency exchange. Currently, Dr. Hung serves as Vice Chairman for FameG, a microelectronic company that designs and manufactures computer chips. Dr. Hung received an Honorary Doctorate of Laws from the University of Victoria, in May 2005, at a special ceremony in the Great Hall of the People in Beijing. Some of his other honors include being named Justice of the Peace, Chief Executive of the Hong Kong SAR; his appointment to the Chinese People’s Political Consultative Conference; and serving as a member of the Board of Governors for the Association of the Celebration of the Reunification of Hong Kong with China. A firm believer in the importance of education, Dr. Hung is very happy to be helping students through scholarships that can be offered on a perpetual basis. Dr. Hung is an avid soccer player and fan, and has served on the boards of numerous sports and educational organizations. He is married and has three children. Bob Love graduated from McGill University's Faculty of Medicine in 1950. He and Nancy were married that August, and Bob went on to take two internships. He took a position with the C.G. Williams Clinic in Trail, BC. In 1955, they went to Vancouver, where Bob was a resident at the Vancouver General Hospital. In 1961, with three young children, Bob and Nancy moved to Toronto, where Bob undertook his last year of post-graduate studies. Bob and his family then returned to Trail, where he practiced Internal Medicine for 22 years, then concluded his career practicing Nuclear Medicine in Victoria. One of their four children, Robin, studied medicine (UBC, 1986), and also started a family during medical school. He lives in Nanaimo with his wife, Deirdre, and their family. There, he practices family medicine and palliative care. He is an active participant in the UBC Family Medicine and Island Medical Program teaching programs. Robin recalls his parents being very supportive of education and encouraging about starting a family while in school. "You just have to be hardworking and clear about your responsibilities," they told him. As a tribute to their husband and father, the Love family established a bursary for IMP students who have children. It is the Love family's hope that it will help ease these students' way through medical school and encourage them as they learn medicine while caring for a family. Drs. Patrick and Diana White have practiced family medicine in Victoria for over 35 years. In retirement, they continue to enjoy part-time work in a travel medicine clinic. Patrick's connection with UVic dates back to 1957, when he enrolled in Victoria College, as it was then known. His received his BA as part of the first graduating class in Victoria. He then earned his medical degree from Glasgow University, where he met Diana, who was in the same class. They have four children, all graduates of UVic. One daughter is now a practicing physician in Australia. This same daughter, in her early working years, introduced Patrick and Diana to medical care for Indigenous peoples, specifically the Gwitch'n, whom she served intermittently for five years in northern Yukon. Here in Victoria, one of Patrick's and Diana's medical partners is of Indigenous heritage. These experiences influenced the Whites to create this bursary for medical students of Indigenous descent, and/or who graduated from a high school on Vancouver Island. As a retired family physician who started his post-secondary studies at UVic and then went on to obtain his medical degree from UBC, Dr. Young and his wife, Patricia, herself a UVic alumna, wanted to make a difference in students' lives. "We support a scholarship for IMP students because it's something we believe in. Medical education has become very expensive. By easing a student's way, even by a little bit, we feel we can make a difference," said the Youngs. "It gives us tremendous personal satisfaction and a sense of being connected to both UVic and UBC." Their scholarship supports a first-year student who graduated from a Vancouver Island high school and who's also actively involved in their community. Dr. Bob Young attended Victoria College (UVic's predecessor) in 1947, then went on to earn BA (UBC, 1952) and a MD (UBC, 1956). He was a member of the third graduating class. After interning at the Royal Jubilee Hospital, he launched a private practice in Victoria. During his 38-year career as a family physician, Dr. Young earned a reputation as a dedicated and tireless local member of the provincial medical community. He was an elected member of the BC Medical Association Board of Directors for 20 years. These were the years during which the Association introduced and promoted seatbelt, bicycle helmet, and infant car seat legislation. As Chair of the BCMA Communications Committee, Dr. Young helped bring these initiatives into law. In addition, he edited the BCMA News for 20 years, the Association's award-winning political publication. He also authored more than 1100 weekly medical columns between 1975 and 1997, which were published in local BC newspapers, and also picked up by papers in Yellowknife, Alberta, and the Maritimes. Dr. Young served terms as President of the BC Section of General Practice, as a delegate of the Victoria Medical Society, and was an active staff member of the Royal Jubilee Hospital and the Veterans' Hospital, serving as chairman and member of many committees during his career. In 1988, Dr. Young was the inaugural recipient of the BCMA's Dr. David Bachop Gold Medal, given in recognition of his extraordinary contribution in the field of organized medicine and community service. In February 2011, at UVic, he was honoured as the first recipient of the Distinguished Alumni Award for the Division of Medical Sciences. Dr. Young passed away in May 2011.